Posted 3/29/2019 9:59am by Joanna Marie. We want to share the freshness & true taste of the farm with you. Don't miss out on our first deliveries to Simplee Gourmet on April 10th & 11th as well as Especially For You Florist on April 10th; sign up here. Posted 3/7/2019 8:27am by Joanna Marie. Our season 18 sign ups are now open. Let us farm for you this spring. Our deliveries will be once again at Simplee Gourmet in Covington and New Orleans with an additional location in Ponchatoula. Posted 12/7/2018 3:42pm by Anne Sharp. We want to thank all those that allowed us to farm for them this season. It seems like yesterday Grady and I were in the barn counting and sorting vegetables for week 1 and fast forward 12 weeks and we are done. It is such a gratifying part of what goes on a Covey Rise. Stay tuned for signups for the spring. Posted 9/6/2018 11:04am by Anne Sharp. We want to share the freshness & true taste of the farm with you. Don't miss out on our first deliveries to Simplee Gourmet on September 19th & 20th; sign up here. Posted 8/20/2018 12:51pm by Anne Sharp. Let us farm for you this fall; we will be at Simplee Gourmet in Covington on Wednesdays and New Orleans on Thursdays beginning the 3rd week in September. LET US DIG FOR YOU! Posted 4/4/2018 2:11pm by Anne Sharp. Only 1 week until the first deliveries of our 12 week produce club season; Grady wants to be your farmer! Posted 3/5/2018 1:31pm by Anne Sharp. Our first delivery to Simplee Gourmet in Covington will be Wednesday, April 11th from 12:30-5:00 pm. Deliveries of boxes to Simplee Gourmet in New Orleans will begin on Thursday, April 12th from noon-5:30 pm. Don't miss out; we are planting each and every week now that the cold is behind us. Posted 1/31/2018 11:22am by Anne Sharp. This winter has been like no other for us-2 snows, many mornings with glistening frost, freezing temperatures and no sign of the sun. The good news is our produce club will begin mid-April, a firm date will be announced in a couple of weeks. We are thrilled to be adding a second pickup location for our 16th season. Simplee Gourmet now has a New Orleans shop and will offer boxes for pickup on Thursdays. We will continue with our Wednesday delivery to Simplee Gourmet in Covington. The sun is out, the tractors are humming, spring is on it's way-stay tuned. Posted 12/8/2017 2:18pm by Anne Sharp. Fortunately it only happens only once every 10 years or so but this morning we woke up to a blanket of snow. That did not stop our trucks from getting to the city to deliver to many restaurants that embrace a local product. We love growing for you!!! Posted 9/16/2017 9:59am by Anne Sharp. This Wednesday will be week 1 of our Fall/Winter season-don't miss out on farm fresh vegetables for your family. 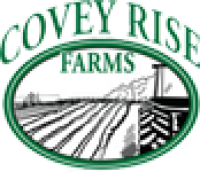 All content property of Covey Rise Farms. PO Box 40, Husser, LA 70442.